How Many Calories Do Negative Calorie Foods Burn? Advocates of negative calorie diets suggest that the energy you use to chew, swallow, digest and excrete certain foods exceeds the caloric content of the food. They claim, for example, you can spend 80 calories digesting 25 calories of broccoli. Credible research raises questions about these claims. Low-calorie, high-fiber foods that reportedly take more than they give include fruits such as apples, blueberries, cantaloupes, grapefruits, honeydew melons, raspberries and strawberries, as well as vegetables such as asparagus, broccoli, cabbage, carrot, cauliflower, celery, cucumber, green beans, salad greens, tomatoes and zucchini. The thermic effect of food -- the amount of energy used to consume, digest and eliminate it -- has been scientifically established to be far less than proponents of negative calorie diets claim, according to MayoClinic.com. On average, the daily thermic effect of all foods people consume is about 10 percent of the total caloric value. The thermic effect for fats is 3 to 5 percent; for carbs it is 10 to 15 percent; and for protein it is about 30 percent. If you weigh 150 pounds, you use 68 calories per hour sitting and watching TV. 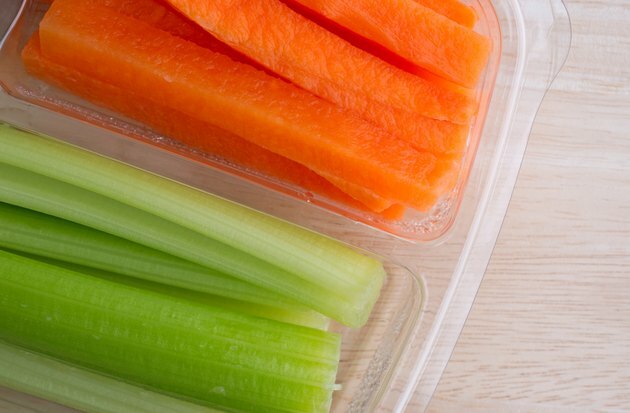 A 1-cup serving of celery contains only 16 calories once you adjust for the thermic effect. So, eat that cup of celery slowly while watching 15 minutes of TV and you will burn all the celery calories and a few extra. BurnTheFat: Negative Calorie Food: Fact or Fiction? MayoClinic.com: Negative Calorie Foods: Diet Gimmick or Weight-loss Aid? How Many Calories Does Eating a Celery Stick Burn? How Many Calories Does Digestion Use Up?